After Norwegian shipping was heavily affected by reduced trade during the napoleon wars of the first part of the 19th century, the industry again grew strongly from the 1820s to the 1880s. Norway became a leading maritime nation, and this became a source of national pride. 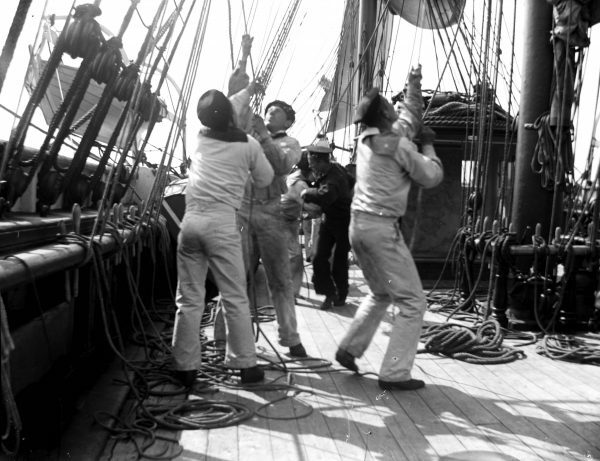 Shipping was important for young Norwegian boys who needed work and income. Many young people were using this as a start of working life and adulthood. Concepts like youth and adolescence were unknown and adolescence were unknown, most often it was the confirmation that served as a sharp distinction between childhood and adulthood. Illustrative image of a bark in the 19th century. One of those who traveled was Lorens Brun. Lorens was born in the city 1866 as the eldest son of Pharmacy Brown. Unlike many other boys who traveled, Lorens was from a wealthy family. He was only 15 years old and not confirmed when he stepped on board the bark ship “Leif” . The university library keeps a copy of his diary notes, giving us a rare insight into the daily life of a young sailor in the 1880s. 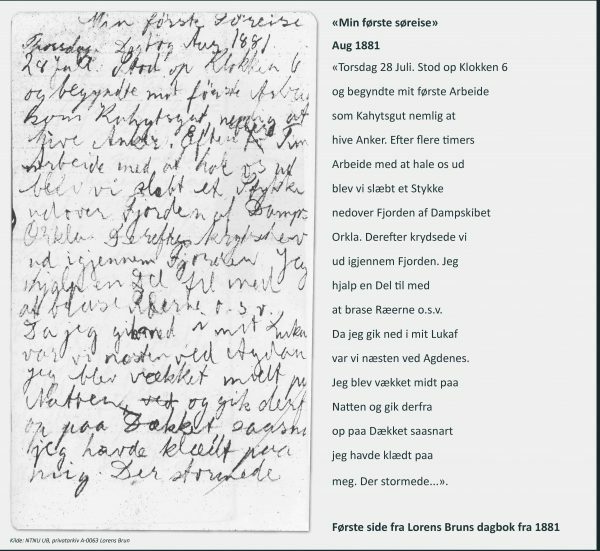 NTNU UB, private archive A-0063 Lorens Brun. Below two pages from the diary. The first picture shows the first page in the diary, “my first seatravel” aug 1881. 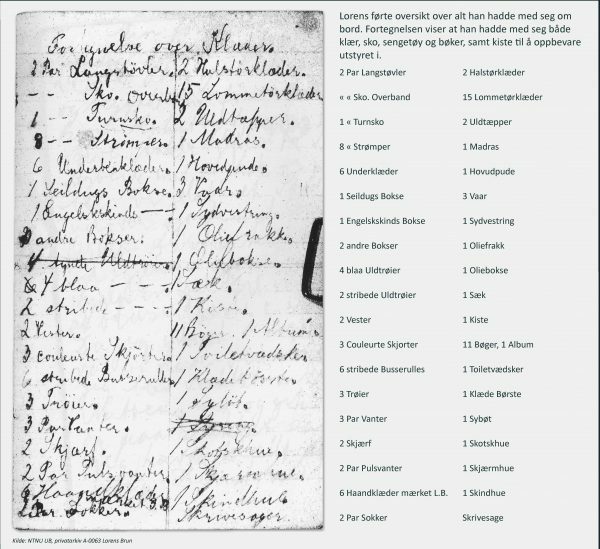 The second picture of the diary page is the equipment Lorens brought with him. Why did he travel out? We might not know for sure, but maybe the adventurousness was so strong that the family let his eldest son go out on this journey? Perhaps he was inspired by the military tradition of Bruns long traditions, because this journey was for him also the beginning of a military career. 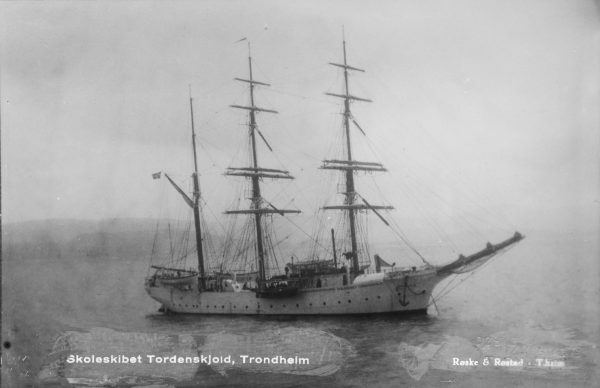 On 28 July 1881 the ship sailed out of Trondheim with a course for America. Lorens were part of a crew of a total of eleven men. Lorens stood at the bottom of the hierarchy on board, and for a young man from a wealthy family this must have been a big change from his life in Trondheim. 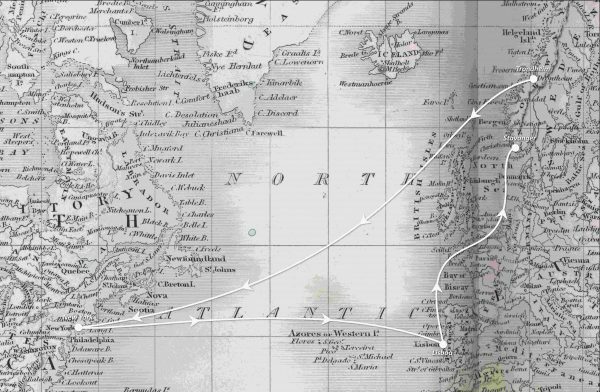 The young Lorens wrote diary throughout the four-month sail. Departure day Thursday 28 July. Arose at 6 o’clock and started my first work as a “Kahytsgutt” with lifting anchor. After several hours of work, we were dragged down the fjord with the help of the steamship Orkla. Then we crossed the fjord. There was a terrible storm. We had to take down all sails and throw anchor in Brækstad Bay at Ørlandet. I went to bed and at 4 o’clock. The ship stayed in Brekstad Bay for 5 days. Saturday, July 30th. Got up at the clock 91/2 and started the day helping to pull anchor. We are still in Brækstad Bay. In the evening I had the fishing line out, but with the same result as yesterday, no fish. The officers who had fished before I started had a total of about 20. There have been many boats seen with fishermen. When I got into my bed to lay down, I found the shipdog, lying in my bunk. I pulled the dog out, then prepared to get a good deal of fleas the next morning. Wednesday 3th of August. Today we finally left Brækstad Bay where we had spent 5 days. We put up the sail on and I helped. We left Briggen from Arendal who was far ahead of us and sailed so far beyond that we could not see it without binoculars in the evening. In the afternoon I cleaned and washed. In the evening, the steamship Uranus sailed past us. Tonight, I have written a letter home to my father. The second half of the 19th century was a break time in shipping, as it was on the mainland with modernization of agriculture and industrial development in the cities. The old wooden sailing ships were challenged by steamers, ans Lorens depiction of the staemship that passes by the sailing ship is a good picture of what became reality towards the late 1800s..
Lorens tell about steam ships that passes by the sailing ship. As they approached New York, the number of ships increased, both sailing ships and steamers, this is a good picture of what became reality towards the late 1800. After six weeks at sea, the ship was promoting in New York. September 9th. We have spent the whole day outside of Staten Island. This morning the skipper went to land and was gone all day long. In the evening the skipper came on board and brought with him a little American boy with whom I spoke English. September 18th. Sunday. Today, when I came out I heard that 4 men had escaped by night. Itinerary trip from Trondheim to New York via Lisbon. Some people used the transfer to emigrate from Norway to the United States. For Lorens this was not an option, and he continued when the ship left for Portugal. On the tour over to Portugal they entered a heavy storm and Lorens tells in his diary about what must have been very dramatic days. October 5th. I was awakened by a terrible noise something before 4 o’clock . I got up on deck, the waves and wind hit us contstantly. I was up on deck until 7 o’clock when I went down and then I slept from 10 am to 12 pm. In the afternoon I was on deck when the big upper sail was demolished. October 6th. Today, the weather was even worse. I was thrown over by the wind and water and I got a hard blow in my head, I thought for a moment I was thrown overboard, but happily I was not. After these dramatic days, the weather was mostly good for the rest of the journey. Lorens tells less and less in his diary, it eventually becomes a log of what guard he had and how the weather was. When the ship arrived at Stavanger on November 28th, Lorens returned to Norway after a four month long journey, exactly one month after arrival Lisbon. Lorens were confirmed following spring after returning home. This journey had probably given him a taste for the sea. He later went to the warship school and became premier lieutenant. He went to America and worked several years in Argentina and Brazil, among other things, as a Norwegian-Swedish visa consul, surveyor and ship broker. Later in life he moved back to Trondheim and worked as a customs treasurer until 1936. 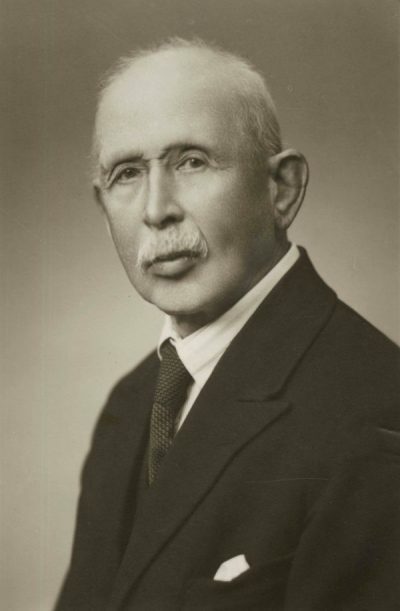 Lorens Brun died in 1944. Great story! It is so exciting to read about things like this! Great Story! It is so exciting to reading about things like this!